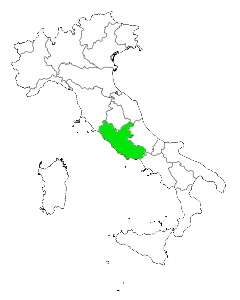 with six other Italian regions which are Tuscany to the north, Umbria, Marche and Abruzzo to the east and Molise and Campania to the south. Lazio like most Italian regions has a wide variety of terrane to navigate if you are traveling throughout the region with the mountains to the east and the coast to the west. Lazio has 130 miles of coastline with about 95 miles of which has great beaches. area near the town of Minturno and going all the way up the coast to just a little north of Rome is almost nonstop beach resorts. There are some areas of cliffs and rocky beaches but anywhere there is areas of sand someone will be there. Of course not every beach is a resort because there are many areas along the coast where the local residents go to enjoy the sea. From Fiumicino which is the coastal town nearest Rome to the port of Civitavecchia the beaches aren't as good because it is a rocky region. There are beaches along this stretch of coast but not as many as to the south of Rome. North of Civitavecchia to the northern border of Lazio are more beaches but again not as many as to the south. Rome along with Athens and Cairo are the most famous and talked about of the ancient cities and Rome is the most famous in Italy. Rome of course was the name of the empire that ruled the world 2000 years ago. Now Rome is a favorite tourist destination not only for Italy but for entire world. Some of the highlights of Rome are the Colosseum, the Roman forum, the Spanish steps, and the Vatican.